There was the flickering of candle-lights and a sense of solidarity last Thursday night in the Grand Courtroom. 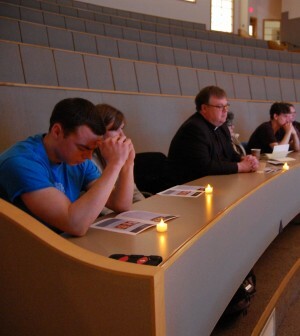 The Muslim Student Association (MSA) held a vigil for the victims of the Chapel Hill shooting. Deah Shaddy Bakarat, 23, Yusor Mohammad Abu-Salha, 21, and Razan Mohammad Abu-Salha, 19, were killed Tuesday, Feb. 10 at their home in the Chapel Hill condominium complex, near the University of North Carolina, which they attended. The suspect in the shooting is their neighbor, Craig Steven Hicks. However, there is controversy if the shooting was motivated by a parking dispute or by religion. Ali Munshi, freshman MSA member, disputes the parking spot theory. Ayah Galal, freshman and member of MSA, also believes that the victims were targeted for being Muslim because the women, Yusor and Razan, wore hijabs. Also, she doesn’t believe that the story was covered as well as it should have been. “These three students were the role model students. This story didn’t ’make headlines as much as it would have if it was a Muslim behind the gun,” she said. The vigil itself consisted of a series of speeches and a poem, followed by a moment of silence. 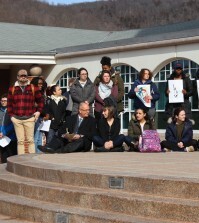 There were members of other groups in attendance, including the Quinnipiac Christian Fellowship, the Quinnipiac Catholic Chaplaincy, the Jewish Student Organization and the Office of Multicultural and Global Education, all there to lend their support. “The more people come together–in good times and bad times–the closer people become,” campus Rabbi Reena Judd said. Galal was pleased with the turnout. “It’s nice seeing students from different backgrounds, religions and races coming out and coming together to show that this is just one race: the human race,” she said. Munshi, also reflecting on the vigil, thinks that change needs to happen. Galal believes education and information can prevent events like the Chapel Hill shooting from happening again. 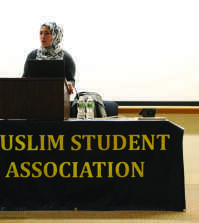 Along with having the MSA put on more events, she thinks that students should feel comfortable with asking the Muslim students questions about their practices. “I love answering questions. I’d rather have people know than not know,” she said. Senior Andrew Perazella, who comes from a Catholic background, also attended the vigil. He said change can also come from addressing the wrongs of society. “What I was always taught is that silence means consent, meaning if you don’t speak out, you’re allowing it to happen,” he said.